oh Mr Postman, hurry up and bring me my copy! Sounds exciting and fun! I can't wait to check it out, will be off to buy the issue today! Looks like you swam, and swam pretty good! Spread looks fabulosa. I got my copy late last week, and I had already decided that this was my favourite feature in the issue! 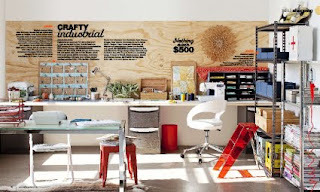 I particularly love the crafty industrial spread. Do I need that Kartell step ladder? Yes, I think I do! 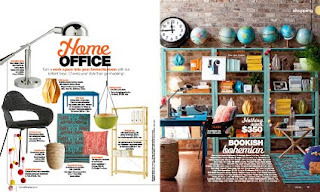 Congrats, the spread looks amazing, I'm particularly in love with the office featured - stunning! I can't wait to pick up my copy of the magazine. Great work! Wow, jumping in head first is the only way to go. Will have to head up and grab a copy of this issue. I love the room with the globes all along the top! just gorgeous - love all of them. When does it come out in the US? Congratulations Natalie! That is just fabulous. I truly love them all. Is there anything you cannot do lady!? Oh wow congats! How exciting for you! The feature looks so stunning, I'm off to run out and get a copy! LOVE IT! LOVE IT! LOVE IT! Can't wait to get my hands on the mag, heading to Borders now! My copy arrived on Friday and I've already read it cover to cover. This was my favourite feature! I noticed your name on it but didn't realise it was your first styling gig. Congratulations. I was really, really, really impressed with the amount of detail you included! loved it very very much. Well done! It looks amazing. Don't think I can get the mag in the uk so I'll have to come back to your blog often! Love the looks, and can so appreciate the mega amount of the work behind each and every shot! I love this post! 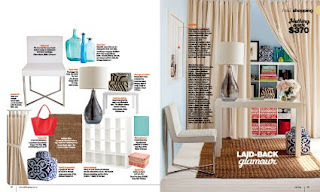 I love all your stylish spaces for this story - you need to do this some more! Thanks for sharing! congrats on the styling gig! awesome things happen when you ask, right? Bookish Bohemian, please. I love the way the metal shelves' color complement the old globes. Nice job! fantastic! love the bottom pic here ~ you did a great job. I just read it yesterday and loved it. Even more so you featured the desk I am going to get for my new office space. julie - got your copy yet? what do you think of the issue? Kylie - thanks for all your kind words and I def think you should get the step ladder. looks cool in real life too. Kloth & Bolt - have already done a styling feature since this one. Not quite so full-on, but hectic nonetheless. I have another one in a couple of weeks. Time is running out! Sarah - which desk did you like? there were about 4 in the shoot (i went a bit overboard!). EVERYONE ELSE - THANK YOU THANK YOU THANK YOU!!! And I'm pleasantly surprised so many of you liked bookish bohemian. It's my fave. Yay! My copy finally came in the post yesterday. Natalie it looks fabulous! There are elements in each of the rooms that I love. 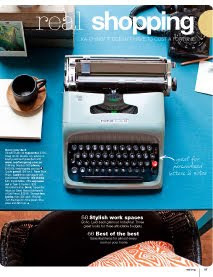 At a pinch my fave would be crafty industrial (white desks, plywood backdrop, and I already have that clock) but the colours you have chosen in bookish boho are beautiful. Love the contrast of the yellows/oranges (especially the wood print cushion) with the blues. This is the type of inspirationI look for in magazines because I wouldn't have the confidence to mix these colours myself. Then when I see it I go "wow". You styled with confidence, very impressed with your first effort! Enjoying the whole issue as always. Really loving the Robert Plumb chair on page 129. Good luck with future styling! Well I loved them all actually but it was the white one with the slim drawer, perfect look for my sson to be office and it is a great price. first ever!! omg no way! that was my favourite section of the mag. I just LOVED the colour combos. so perfect. I dream of having my own home office / studio, probably a mix between the first and last rooms you styled. The first look also excited me very much because I have those ikea storage shelfs, and seeing them painted that colour made me realise all the possiblities I could do with them!! I arrived at mum's today with my fevering toddler, sat down in her big armchair and whilst I rocked her back and forth whispering shhh shhh it's ok darling, I flicked through the pages of Real Living. When I came to the shopping editorial, I thought 'Gees I love the styling on this shoot, particularly the collection of globes bobbling on bookcases'. Good on you for following your intutive hunch by being pro-active and asking for an opportunity to share your talent, I hope this is the first of many to come.